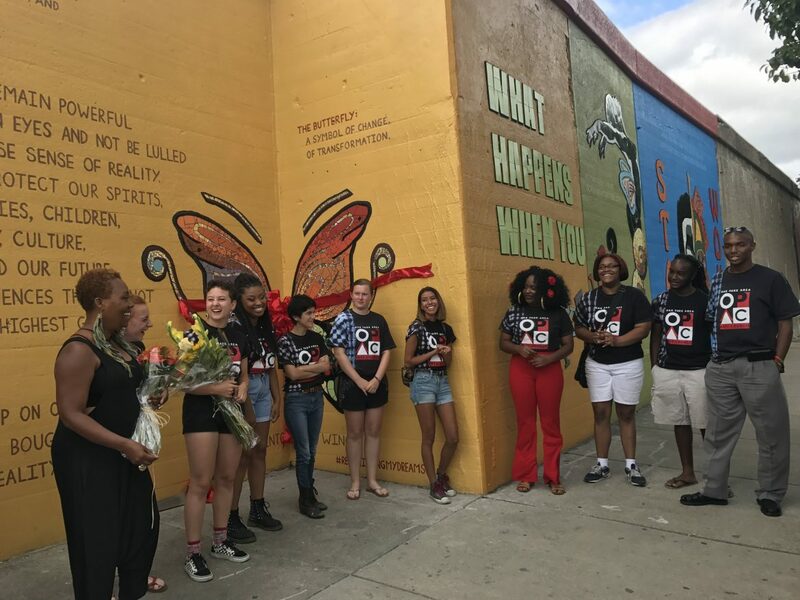 Austin resident Tracey Showers is so proud of her 19-year-old daughter Madison Isidore for being part of the team that created a beautiful and inspiring mural at the intersection of Central Avenue and Lake Street. “She’s able to give back to the community in a way that she loves,” Showers said Saturday morning during the ribbon-cutting ceremony where dozens of residents and parents gathered to cheer the completion of an eight-week art project. Fourteen high school and college art students from Austin and Oak Park made the vivid mural. The mural, named Wake Up, is on the north side of the Green Line Central station and across from Austin Town Hall. The mural is intended to provoke anyone who see is to think about the shared pursuit of dreams from the neighboring communities of Austin and Oak Park, said professional artist Carolyn Elaine of the Oak Park Area Arts Council. “We started out having a conversation about how there are so many common things between people of different communities, and what it is like to step out of your world and into someone else’s community,” said Elaine, a 12-year instructor with the Off the Wall program, which has hired West Side teen to work with professionals on public art pieces every summer since 2005. “No matter what community they are from, they still have hopes, dreams and aspirations for their future,” Elaine said, adding it’s the second year that Austin and Oak Park teens have worked together. The art pieces completed last summer included a mural called Empower Change, which appears underneath the Austin Boulevard viaduct on the east side of the neighborhood. This year’s Wake Up mural consists of three parts, each representing the different stages of an individual awakening to his dreams as well as the reality, Elaine said during last weekend’s unveiling. “It’s really owning your dream and being the change that you want to see in the future,” she said. 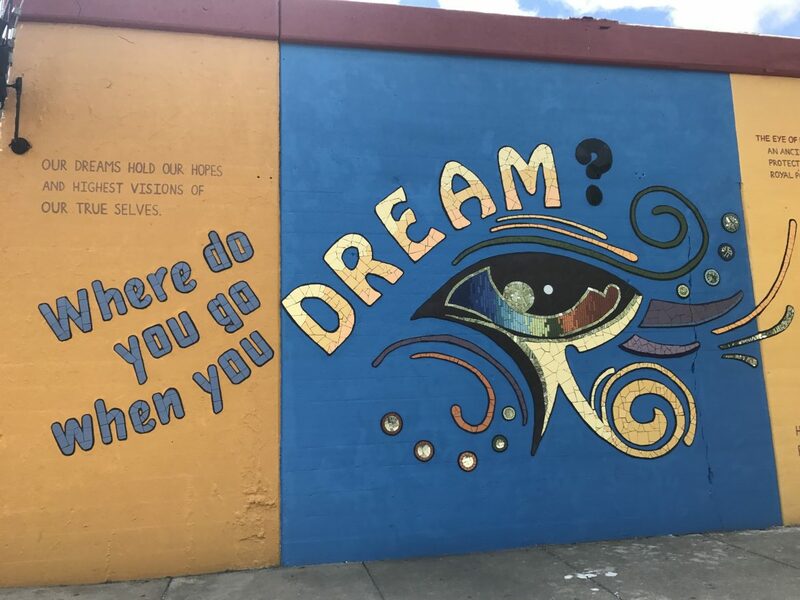 While it’s a great opportunity “for talented young artists to come together for a common goal,” the mural also sends a powerful message to whoever walks pass the area, said Camille Wilson White, executive director of the Oak Park Area Arts Council. “Last spring, there was a hateful evil that went on right on the corner of Corcoran Place and Central Avenue, a young man lost his life to gun violence,” White said, referring to a shooting in the middle of the day outside the Green Line station that left many in the community shaken. To Austin teen Isidore, who just became an art student at Dominican University, working on such a big-scale project with a tight schedule was a bit overwhelming. But it was all worth it after seeing the first mural she’s ever worked on being completed, she said. “I had no idea this mural will end up being this huge and this beautiful,” Isidore said. Being part of the project, which involved a lot of designing and painting, gave her valuable professional experience, she said. One of the images the mural features is a half human, half mask face, and that’s what Isidore believes will have the biggest impact on the community. The half-masked face is also Oak Park teen Ursula Riess’ favorite piece. “I think that’s really relevant today – about being aware of what’s going on in the world and issues that are important to protecting your own rights and the rights of others in the community,” said the 18-year-old, who as one of the veteran apprentices led this summer’s team. To Austin teen Derrell Little, 16, who lives down the street from the mural, the experience was life-changing. “We put it up really fast. But when we were doing it, it just took a long time,” Little said, adding that’s an important lesson. After completing the first public art piece he’s been part of, the teen said he was more assured of where his interest lies and how powerful art can be. “When people read [the statements], they really get a clear message about it and start to think,” he said. Ald. Chris Taliaferro (29th), who has been working with the Oak Park Area Arts Council to bring public art to the ward, said the program invokes hope and inspirations while bringing Austin and Oak Park together once again. “Every single piece of energy and effort that you put into this is gonna make people proud of the community in which they live,” Taliaferro told the crowd of young artists before he cut the ribbon attached to the butterfly image on the wall. While some express support for the city's plan, others remain concerned the West Side was not singled out for specific projects.